Skin allergy is an over-reaction of the skin to a contact with particular substance that your skin is sensitive or allergic to, which is normally harmless to the non-allergic person. People suffering from skin allergies are often allergic to more than one substance. Skin conditions caused by allergies may result in eczema or dermatitis. 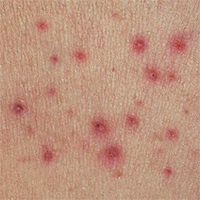 Itchy rash is a common symptom for skin allergy. In fact, the true reason for allergic reaction to some substances or food - is the immune response of over-active immune system. Normally, the immune system acts as the body's defense against invading agents such as bacteria and viruses. But in the case of an allergic reaction, the immune system is responding to a false alarm. Allergy develops after repeated exposure to the causative allergen. When the allergy-prone person first comes into contact with an allergy-causing substance, this allergen is treated by the immune system as an invader and it mobilizes to attack by starting the process of sensitization, that may take up to 6 weeks to develop. During this process white blood cells produce Immunoglobulin E (IgE) antibodies. In some time on the repeated exposure to the allergen, these IgE antibodies bind the causative allergen and attach to mast cells, that release chemicals known as mediators, including histamine and prostaglandins. These mediators trigger allergy symptoms: histamine stimulates mucus production and causes redness, swelling and inflammation, while prostaglandins constrict airways and enlarge blood vessels. In different people substances that may cause an allergic reaction are different, below are listed the most common ones. some herbs. Common plant allergens are:	poison ivy,	poison oak,	poison sumac. Formaldehyde found in paper products, fabric finishes, paints, medications, cosmetic products, household cleaners. several metals as: nickel (frequently encountered as buttons or clasps on jeans clothing), gold (precious metal found in jewelry), cobalt (contained in some medical products, antiperspirants, hair dyes, metal plated objects, cobalt blue pigment), mercury compound (used in some antiseptics and vaccines). second, take a proper care of your skin during the flare-ups of skin allergy condition. Prevent skin allergies by not allowing allergens to enter the outer layer of your skin by using shielding lotions. Shielding lotions bond with the outmost layer of the skin, converting it into what works like an invisible shield, keeping irritants out while sealing skin�s natural moisture and preventing skin from dehydration. "I had been having trouble with skin allergies - a rash on my left hand for over a year. I had this problem when my children were small. We called it "housewife�s hands", but I had not been bothered with it for years. I have also worn rubber gloves (latex) for years when doing dishes or scrubbing, etc. When I could not get this rash to go away, I tried many lotions and medicated creams, to no avail. Also it seemed to be worse around my ring finger. I finally had to have my wedding ring cut off thinking I had skin allergies to metal. I finally went to my doctor and she told me to get rid of my gloves and get milder dish detergent. It helped somewhat but it seemed that even just water would irritate my skin, so when I read about your product in Alternatives newsletter, I decided to try it. My hand has been cleared up for the last few weeks, and I try to use Gloves In A Bottle at least twice a day. It seems to be working!" "Gloves In A Bottle has been such a God send for me. I have been diagnosed with skin allergies to Nickel Sulfate, Potassium Dichromate and Wool Alcohol. In other words, I am allergic to just about everything I touch. After years of suffering, countless dermatologists' visits and prescriptions, I have found great relief with Gloves In A Bottle." I suffer (as well as my mom and 3 aunts) skin allergies for soaps (for dishes and clothes), with mom and aunts we had visited at least 20 diff doctors and tried ALL creams available, including some home made things. Well, nothing worked so far, till I found your product. I�m from Peru, and I want to send home as much as I can find, they going to love me! Not only helped me a lot with my skin allergies (now I'm able to do dishes without gloves) but it also restored my skin!"